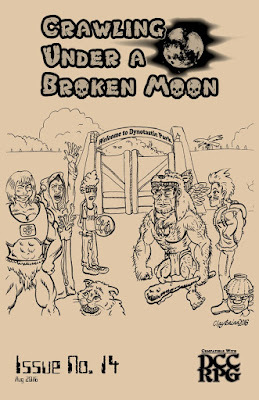 Crawling Under a Broken Moon #14 was written by Reid San Filippo and published by Shield of Faith Studios. This issue is the first part of the Dinotastic Park "semi-hex crawl across the remnants of an abandoned, dinosaur live attraction theme park from another dimension." Background, rumors, and legends for Dinotastic Park. A short article that describes what a "semi-hex crawl" is, common themes for the adventure, random encounter tables, and the basic information that will bring the setting to life. Descriptions of pre-populated Hexes 100-134. Charts to help the harried judge populate blank hexes, either as part of prep or during play. Want to play a dinosaur? This issue gives you three options: the Sorceraptor, the Sky-Sneak, and the Battle Chanter. 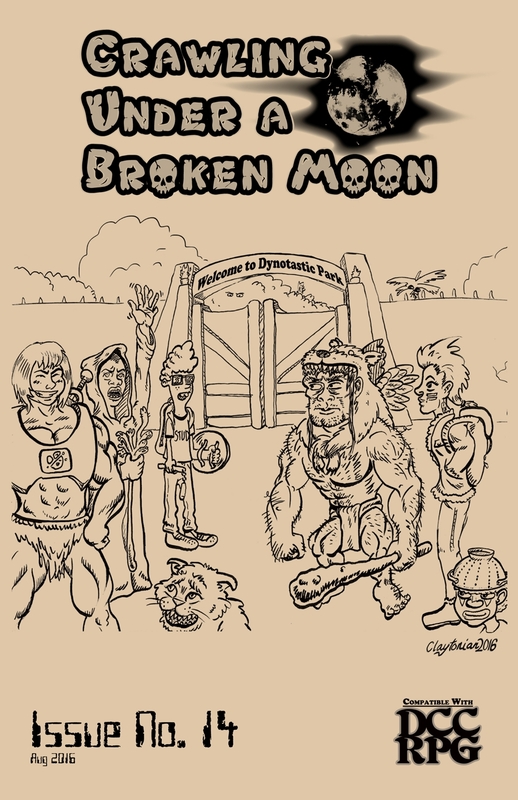 This issue gives you the Once-Men (descendants of the human park patrons and staff), Pure Breed Dinosaurs (not all of which are dinosaurs, but plenty of which are included), Dinosaur Aberrations (tables for changing dinos), and Proto-Saurians (humanoid dinosaurs).